Duggar Family Blog: Duggar Updates | Duggar Pictures | Jim Bob and Michelle | Counting On | 19 Kids: Baby Dilly Coming Soon! Baby Dilly #2 is due in early July, which means it's time to guess when the little guy will arrive. 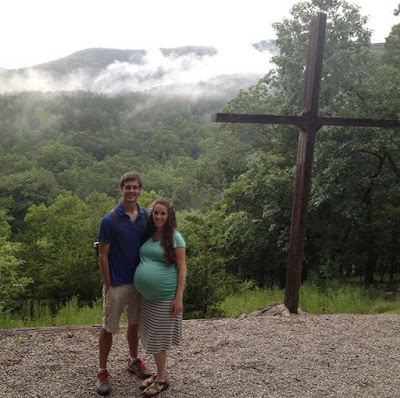 Parents Jill Duggar Dillard and Derick Dillard announced his name earlier this month: Samuel Scott Dillard. Older brother Israel David Dillard was 11 minutes short of being two weeks overdue. He entered the world on April 6th, 2015, weighing an impressive 9 lbs, 10 oz. and measuring 23 inches long. At the time of the birth, the hospital was reported to have only delivered one other baby as long as Israel since the beginning of 2014. When do you think the Dillards' second son will make his grand entrance, and how much do you think he will weigh? Why hasn't Jill given her due date this time? It's probably so people won't be posting negative comments if she goes over her due date like last time. I certainly wouldn't tell anyone other than close family. Probably so she will not be criticized for allowing herself to go over her due date like she was last time. The Duggars are criticized for everything, and accused of "lying" constantly, so I'm sure she'd like to avoid that by just saying "due early July." I think July 4th, I pray that she can have a safe home birth this time. Blessings to the family. I think he'll arrive on July 4th!!! I think he'll weigh 8 pounds. I am guessing he will arrive on July 2nd. He will weigh 9 lbs 4 ounces and be 22 inches long. My guess is July 11, 9 lbs 1 oz. My guess is he will be arriving on July 4th and will weigh 9lbs 12 oz. I think that Samuel will come July 6th and will weigh 9lb 8oz. Congratulations to the Dillard/Duggar families! I'm going to say July 7th 10 pounds and 23 1/2 inches long. At 7:17am. July 7th 9lbs 15 oz and 23 inches long....maybe even 10lbs 2oz? Here is to an uneventful labor and delivery with the end result being a happy and healthy baby and mum! What month is Anna due? July? Jinger is not pregnant, Just saw her in Texas today and she not pregnant. Don't think Jinger and Jeremy are in any big rush which is good, they want to spend some time together and get established before children come along. I think Joy and Jessa are a safer combo bet. Also don't forget Kendra, she could be pregnant by christmas if the date for their wedding is true. Really wish she and Joy would take a leaf out of Jingers book. Hello everyone! Honestly I just pray for a safe delivery for Jill. My guess is the baby will be a " Yankee Doodle boy , born on the Fourth of July !" Lol yet seriously concerned that Jill may have to have another c section as not to be rude it seems like another good sized baby! I really wish they would be home for the birth. Good luck and God Bless. They are here in the United States but she's at best a vbac opportunity and potentially a second c section. I think we should all hope the have some sense and go to a hospital. They are home! She was in Joy's wedding in May. They are home in Arkansas they be home since joy's wedding. Hoping for an easy delivery, and happy, healthy baby boy! Looks like I was wrong lol. It's July 5th and little Samuel is still in his Mama's belly. Samuel Scott is a lovely name. July 12th and 9 pounds, 8 ounces. My guess is whenever Jill is good and ready to push out a baby. Judging by last time, who knows when that could be. Could be 2 days after labor begins. It's creepy and jinxing to try to pinpoint an exact day, anyway. She'd have to have shared with us what day she got pregnant. My guess is July 1st, 9 lbs 2oz. 22 inches. Are they coming back to the States to deliver? Be careful! They're already back in the states. Jodie, They been here in the states since May 26th. They have been back for a little while now. Jill was in Joy-Anna and Austin's wedding. July 11th might be later than Jill likes but it seems to be another large baby. Might just take it's time. Wishing them the best and safest delivery. I am thinking July 4th (although I would love to see him born on July 26th because that is my birthday). I'm thinking he will weigh 9 lbs 6 oz and will be 21 inches long. So excited to see pictures of baby Samuel. Do you know if we will be able to see his birth like we did for Jessa's? Strange that this post shows up when there is a rumor going around that Jill is in labor. Maybe baby Dilly #2 is on his way, or already here. I don't think she will go way over this time but maybe about 5 days overdue? She's big so looks like another big baby. Hopefully not as big as Israel so everything goes smoothly. My guess is baby will arrive July 8th and weigh 9lbs 5oz! Dios bendiga a mamá y Samuelito! July 7th, 9 lbs 4 ounces, 21.5 inches. Blessings to the whole family. July 6, and 9 pounds 6 ounces--Stacey in ND. Geeeesh .......and that modest shirt tells it all , doesn't it ? Do they think the looser would make them look bigger,,or something ? Those loose tops aren't all the flattering or comfortable. Maternity clothes have come so far, no need to shoot them backwards to wearing shapeless sacks again. There's nothing wrong with that top. It's most modest than what other women wear these days. It shows off her pregnant belly and she's proud of it. Looser tops are cooler in the summer heat too, all the room allows the air to circulate! Why come on here and be negative?? I would NEVER wear smock maternity top....that isn't what's in style now a days. Just hope he comes when he's ready and she goes to a hospital! Please do not refer to Jill as "Duggar-Dillard". I'm sure if people are reading your blog, then they know who Jill is. Plus, Jill herself does not go by two last names. Thank you. Ellie can refer to Jill what every she wants too. Jill does too go by 2 names. Love the Duggers, but wish the girls would wear more modest maternity clothes. I can't imagine Michelle wearing tops like that. Again, love the family and hearing about them. Completely agree. I realize young people make poor fashion choices sometimes, I know I have. Hopefully they will grow out of this phase and start wearing looser shirts like Anna does. Are you looking at the right picture or did a ad pop up on your screen? Jill and Jessa have both worn very tight shirts with pregnant. You can see every curve, thats not modest in my opinion. Anna and Michelle both wore very modest shifts that weren't skin tight. Love the Duggars. But I wish the Duggar girls would wear more modest maternity tops. I can't believe Michelle would have ever worn skintight anything! Again, love the family and hearing about their day-to-day lives. It is the style right now to wear maternity shirts that are more form fitting. Every pregnant lady that goes to my church wears those kinds of shirts. Maybe they don't like the old tent style shirts that we used to wear. She looks big so maybe 21 inches and 9 lbs 2oz?? If life begins at conception, then Scott is already "here." He just isn't self-sufficient enough yet to leave his cozy little room. So my guess is that he "arrived" close to 9 months ago. Strange comment. Seems like you're trying to provoke. Not buying what you're selling. Jill is still pregnant she couldn't of had the baby nine months ago because Jill was pregnant at Joys wedding that was in May of that his year. Samuel will be born on 3rd July, 8lbs 14oz. July 06, 17 1/2 inches, 8 lb. 9 oz. July 16th means baby would share a birthday with meresith! Josh and Annas baby must be due any day now as well! July 6th, weighing 9lbs, 4oz. Jill's baby will be close to 10 pounds. I sure hope she gets to a hospital if things go sideways. I hope she doesn't labor for 70 hours before she gets some professional help. I think he will arrive on July 9, weighing 9 pounds 2ounces and measuring 21 inches. Anywhere before or after July 4th. I know how it is to have a birthday on the 4th and it isn't fun lol. Why is some people saying her top isn't modest? She's wearing a modest shirt and she's pregnant. There isn't nothing bad about showing your pregnant belly. It wouldn't matter if she wear something loser because her belly is huge. It's going to stick out either way. I don't understand people these days that wants to try to cover their pregnant belly with big clothing and wearing black. It's almost like they are a shamed of it. But yet, when they aren't pregnant, they don't have a problem wearing skimpy clothing and showing off parts of their bodies that shouldn't be showing. 7-11-17.......he will weight 8.11 and be 2 .5 in long..
July 6th and 9 lbs 3 oz that's how big I was. 4th of July baby! 9 lbs. 2 oz. 9 lbs. and 11 oz. July 6th and 8lbs 15ozs. I just read her due date in August of 2017. My guess is Samuel Scott Dillard will weigh around 9 pounds & 3 oz,will be 21.5 inches long & born late on Thursday July 6th American time but Friday July 7th U.K. time,his brother was born at 11.49pm on April 6th US time but it was 5.49 am UK time as The part of America that the Duggar family live in is 6 hours behind us here in the U.K.
Looks like another big baby! Love this family. I agree about those tight, thin maternity tops being a bad choice especially for this modest family. Those shirts are NOT modest in the least. Those two women, Jessa and Jill look sloppy in them, nothing to lecture about IMO....only what NOT TO WEAR when you want to look your conservative, modest best. These two need to sit IN the class and take notes from Alyssa and Whitney. July 10 8 lbs 4oz. Looking forward to the pictures of little Samuel Scott. July 9. Weighing in at 9 lbs. 8 oz., and measuring 21 3/4" long.